I don’t even know where to begin blogging this trip. I will make a short and sweet introduction and then give details along the way. A. The Pacific Northwest continues to show it’s colors as one of the most beautiful places on Earth. B. Do not visit Alaska. You will realize how terrible all other states in the US are and will want to relocate immediately. C. Visit Alaska. It is mind blowing, expansive to the point of insanity, and so rugged and wild, it’ll make you wish you were a moose. 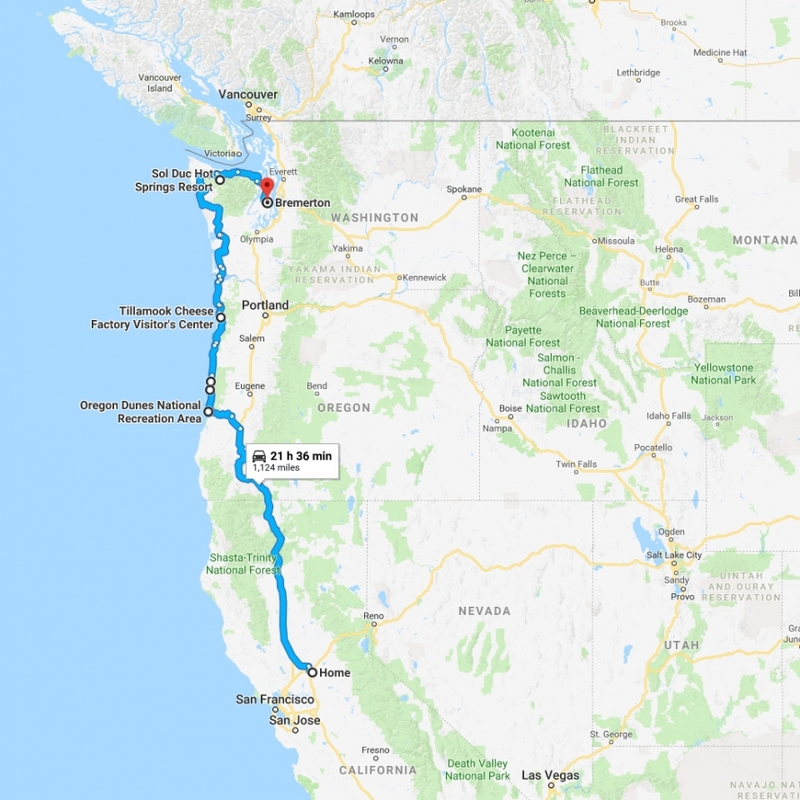 We started our road trip here in Sacramento with our sights set on camping all the way up the coast and flying out of Seattle for a 10 day jaunt in Alaska. More on why 10 days in Alaska is just stupid, later in the post. This was pretty much our route up the coast with some sightseeing stops thrown in for good measure. ***Warning*** This post is ridiculously long. Can’t say I didn’t warn ya. We started our adventure at Cape Perpetua, Oregon. We literally had no idea what to expect and were overjoyed with how incredible the area was. We stayed in the quaint, lush Cape Perpetua campsite here. Now I was tempted to buy the fancy $200 one but I’m cheap and opted for the $30 Coleman which worked wondrously for our needs. The entire Cape Perpetua area has a vast web of hiking trails. View from Saint Perpetua Trail. Shout out to our friend’s amazing homemade jerky. Please do yourselves a favor and make a stop at Yachats Brew. Food was divine and the best sours I’ve ever had. Not sure what she’s asking for here but I’m assuming it’s something that has sugar and is edible. Doing touristy things on our journeys keeps the kids happy so what would a trip through this area be without a stop at the Sea Lion Caves?! I must admit…it was a super cool stop. I was mesmerized by the light and shadows coming from the back of the cave here. And of course the critters. I mean how many band aids does it take to cover her injuries? Traveling with kids is bloody. The big sightseeing spots in this area are Cooks Chasm and Thor’s Well. People do not mess around with their tripods and staking out their spots so be forewarned. Cook’s Chasm. Being near the edges of both Cook’s Chasm and Thor’s Well was a lot more stressful and fear inducing that it looks here. I nearly harnessed the kids and put them on belay just in case. Lots of water, many flowers. When one of your favorite chairs loses a screw in transit, a trip to the hardware store is in order. And a parking lot nap. I have to say that one of my favorite parts of traveling with the kids and having meals out is coloring and doing puzzles and word searches. We don’t have many meals out, but when we do, we break out the 36 color Pentel pen set that at 43 years old, I am still obsessed with. We didn’t intend on visiting the dunes but during a “drive about”, we noticed some pretty stuff so we went chasing it. Don’t skip the dunes. Too pretty to miss. Back at camp…another trail into the deep. So gorgeous. One stop we didn’t make was a visit to the Heceta Lighthouse. I wish we had made time for a visit but a photo from afar is pretty too I guess. We were sad to say goodbye to Cape Perpetua but a stop at the Tillamook Cheese Factory helped me transition from chasms to cheese curds. I wish I had taken more photos of this place as it was AMAZING. Cheese, cheese everywhere. I think we bought enough curds to last us a lifetime which is weird because we ate them all in 2 days. The next stop of the journey was Sol Duc Hot Springs. We are HUGE hot springs fans and this one did not disappoint. We stayed in the Hot Springs Resort Campground in a stunning site on the river in Loop B. Beautiful sunlight filtering through the trees, deer drinking from the stream, and wonderful neighbors who the kids really bonded with made this stop a memorable one for sure. 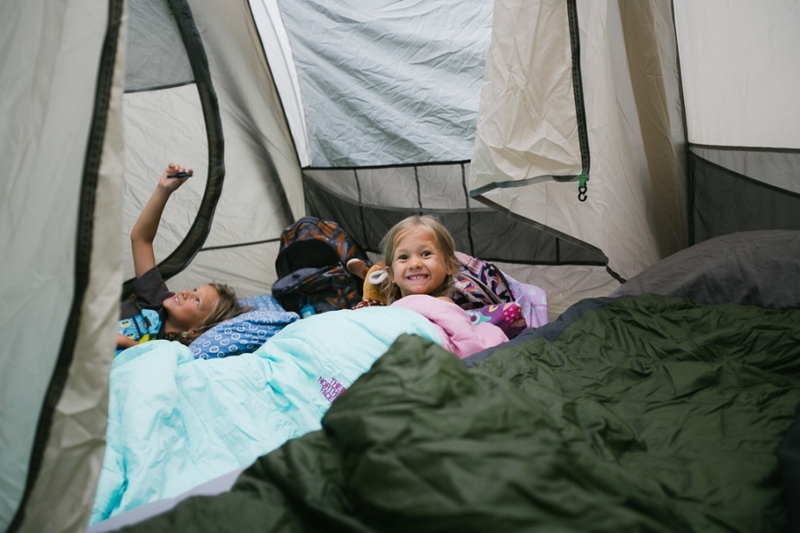 Side note: we are absolutely obsessed with our REI Kingdom 6 Tent with the garage. Ob-sessed. The view from sitting in camp. 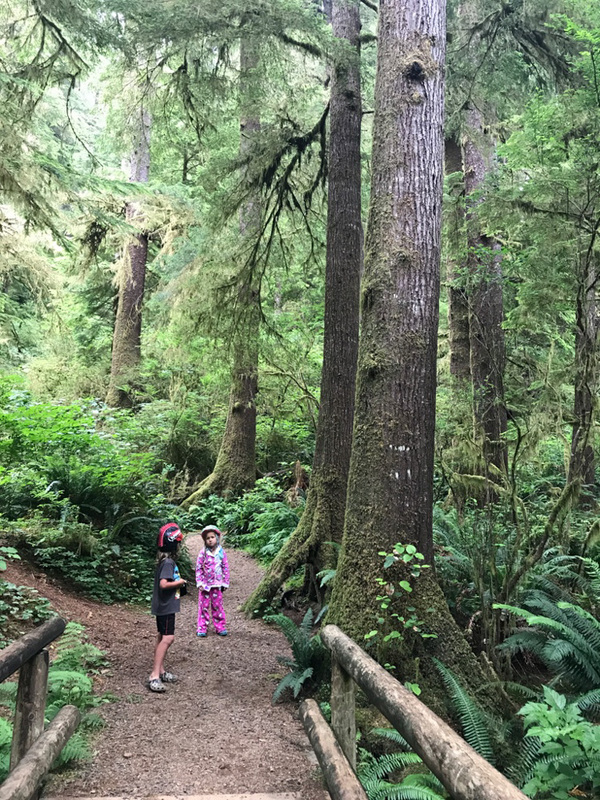 Sol Duc also has an extensive trail system that you can access right from the campground. Convenience and beauty wrapped into one. Well you don’t come across this type of thing every day…a snake eating a frog. Snack break. Because snacks are the force that drives them to do everything. My favorite part of camping is when the kids make friends. My least favorite part of camping is when the new friends move on or we have to leave and the heartache kicks in. The force that keeps me alive…the coffee station. The Sol Duc Hot Springs were rad. Many different temperature pools and very international. With a backdrop view to die for! So…check out the “wood shop” the kids set up here. They were very into “whittling wood” and decorating them with Mr. Sketch markers for their shop. I mean how can you not purchase something this original for a measly 100 pennies?? And they have everything ON EARTH. A slight stretch perhaps. Favorite signs seen on the road…ummmmm…a few letters missing. Our one and only photo from a day trip to Port Angeles. Not as glamorous as a misty rainbow shooting a waterfall but hey…when on the road…stuff starts to stink. Someone is less than thrilled to have to do laundry. He should be lucky we didn’t make him use his own allowance to wash his funky socks and underwear. After a energizing and relaxing stay at Sol Duc, we drove the truck to the Bremerton Ferry to head into Seattle for our flight to Alaska. We would have LOVED to have driven the whole way but we were on a limited time schedule so we figured this would be the next best thing. Taking your truck on a ferry was a really cool experience for the kids. We gave ourselves a LOT of extra time in case we ran into any accidents or issues on the road as we could not miss the flight. With a few hours to spare, we found an awesome zoo to hit up before we had to check in for our flight. We loved the Point Defiance Zoo and Aquarium! Finally…the Alaskan leg of the journey is about to begin! So too is the incessant snacking and having to pee on an airplane. Lort help us. Um…sweet Baby Jesus look at this view. I’m in love already. Again with the limited time thing…Alaska is GINORMOUS. Below are the areas we hit in only ten days and it felt like we were driving through an entire planet. Vastness galore. In hindsight, we should have done whatever it takes to stay at least 2 weeks longer. We landed in Anchorage and stayed a short night in a little run down hotel just to get some sleep after the flight and before heading to Otto Lake. One stop at Wal Mart to fill the cooler with necessities. No, we did not buy 100 pound of ground beef even though the kids wanted it. I mean, really. Warning: food, water, gas, EVERYTHING in Alaska is extremely expensive. More expensive than Hawaii. No, I am not exaggerating. I was not prepared for that at all. I mean, I guess when in Alaska, you are a captive audience so they’ve got you there. They can have all my money. Just take all the money. On our way to Otto Lake, we made some stops along the Denali Highway. We were encouraged to hit up Talkeetna which is a darling town and a base camp for many Denali related activities. You know, like randomly hopping on an airplane right when you get there to fly through Denali National Park in the hopes of seeing the mountain. Again, not on the itinerary or in the budget but was one of the best experiences of the trip. We booked through K2 Aviation and took an old Havilland Beaver with THE best pilot. How do I know he was the best pilot? Because we didn’t crash. FYI…do NOT Google articles on Alaskan plane crashes before boarding. Not very bright, self. I mean if they are going to bicker…better that I’m wearing earphones that I can remove so as not to hear them. So a few things about Denali. I’m talking about seeing the top of the mountain here. 1. She is extremely elusive and rarely shows her face. They say only 1 in 4 ever see her because she creates her own weather system up there. We saw her top for 3 seconds from the plane and I missed that shot. Of course I did. 2. Don’t plan on taking a flight through the park. The weather will dictate that for you. The path we wanted to take was closed for travel due to visibility. Do not mess around with limited visibility in Denali. You will die. We almost didn’t fly at all as the weather shifts from minute to minute. 3. Denali must be a woman due to her strength, beauty, independence, and extreme mood swings. Up in the air…in Denali National Park. My heart exploded a little. Sorry for the airplane ride overshare…the terrain was too amazing to believe. That color blue. The park is so insanely massive that I can’t even begin to describe it’s enormity. Seeing things from the plane that we would have never had the chance to witness on foot made the experience one of our favorites of the trip. My favorite selfie from the trip! I mean seriously. Someone please pick my jaw up from the floor. Goodbye and thank you best pilot ever. Continuing the drive to Otto Lake. Maybe they are worn out? Midnight sun. This is literally 11:30 at night which I can’t believe I haven’t mentioned yet. So ya…it gets dark at midnight here in Alaska and the sun comes up around 4am so you can basically adventure for 20 hours a day. There were a couple nights in Seward where we headed out at 9pm to hike or fish which was really rad. Helps to have flexible kids too I guess who are down for whatever. As long as there are snacks. Not a bad view from the porch. The kids giving their huskies a ride on the swing. Otto Lake…you are kind of pretty. Can’t forget about the “Into the Wild” bus at 49th State Brew. Tourist trap and I’m perfectly fine with that! Back at the cabin. Hold me. So here’s where I would have done things differently. 1. Alloted at least 6 days to explore Denali National Park alone. 2. Brought our backpacking gear, taken the bus the 11 miles in (as deep as you can go), and camped in the middle of nowhere for a few days. I feel like this was such a “touch the surface” Alaskan trip that a lot of how we usually travel and explore was limited due to our time and packing constraints. We WILL be back to redo this part of the trip. No doubt. We did take a gorgeous hike at the edge of the park called the Savage Alpine Trail. This was a good hike at 8.2 miles and 2910 elevation gain and the kids rocked it out! It was by far the windiest hike we’ve ever been on so thankful one of us wasn’t blown off the mountain. These signs were killing us…BAD WOLF! The start of the hike…clear and colorful and winds…calm. The weather is shifting. And apparently Blu needs additional strength training so she carries big rocks to work out her arms. Such an overachiever. Going over the spine. WIN-DEEEE. So ya…that’s what this hike did to her. After our micro exploration of Denali, we headed back towards Anchorage and into Seward for the next leg of the trip. How can you resist a stop at this place? Appropriately titled, “Igloo City”. I am a complete sucker for modern ruins. We walked around and peeked in the windows but after hearing a giant rustling and moan from inside, we hoofed it outta there. Upon reading about it, bears, wolves, and other large creatures use it for shelter so who knows what was in there staking claim. Finally made it to Seward which I will refer to as, “The Place I Will One Day Retire to and Live Old and Happy In”. But before that…so much to do! Like read this board. And the guy’s goal in pink on the upper right hand side of the sign. Cheeky. I don’t remember how I happened upon Box Canyon Cabins but sure glad I did. It was mere minutes from everything in Seward and we had the entire bottom floor all to ourselves. It was a dream location. View from the porch and a playground to entertain the kids. Score. A 3 minute walk down the dirt road from the cabins was Seavey’s Dog Sled Tours. Now I reallllllllyyy wanted to do the tour that you take a helicopter to a glacier and actually run the dogs over ice and snow but it would have cost us a month’s salary so we opted for the next best thing which the kids still talk about almost weekly. It was the highlight of their entire trip! This also happens to be the kids’ favorite photo from the trip. Go figure. Again…apologies for the overshare but I couldn’t narrow down the kids’ favorite all time adventure. The kids with the lead dogs! So apparently, this one was in Disney’s “Snow Buddies” which to my kids, is the greatest movie of all time, so they were over the moon to learn this fun fact and meet this beautiful dog. I’ll take 3 of these to go please. Yep…4 days old. My heart. When your kids are so inspired by the sled dog tour that they set up their own sled races with their blankets and stuffed huskies. These are the travel moments that I will remember forever. Meanwhile, Clark took a fishing charter with The Fish House and shipped back enough salmon and halibut to last us a year! When in Seward, don’t forget to go walk around and fish in Bear Lake. There were so many spots where you couldn’t even see the bottom of the lake because the fish were jammed up all next to each other. Oh and speaking of life goals…here it is. Cabin on lake with plane. The end. Oh a fishing we will go! It’s like so late at night here it’s not even funny. So horseback riding. My old love. Riding horses through the Alaskan wilderness was MY personal highlight of the trip. Just wait until you see the flowing waves of grass, horse mane, and scenery of this trip with Bardy’s Trail Rides. And she’s pretty cute too on the biggest horse they had. That is not pretty at all. At. All. Can we talk about how our guide was packin’??? No messing around here in the Alaskan wild. You shoot a bear dead on the spot patna’! After seeing Seward by horseback and dog sled, it was time to visit the Kenai Fjords by cushy boat ride. The harbor itself is worth a day’s exploration. We opted for the Kenai Fjords National Park tour (6 hours) as the kids are on a short attention span and we didn’t want anyone jumping off the boat. Forgive the crappy iPhone pic cropped to smithereens. I was just excited to see ORCAS! This down there is not an Orca, although the resemblance is uncanny. Please note the size of the little human in red for size perspective. It’s hard to show that type of stuff in photos without a comparison. Back at Box Canyon. The kids love setting up their beds. Exit Glacier, how I love thee. We just took the easy “Edge of the Glacier Trail” and kept walking past the ropes. Some scrambling and loose rock but overall, a very easy jaunt to drink directly from the dripping block of history. Next time we would opt for the more strenuous Harding Icefield Trail for a view above the glacier and the entire ice field. Kids weren’t having 8 miles that day. Took a little detour to watch the fish jump at Cooper Landing. This Russian River Falls trail is a super easy, basically flat, 5 mile jaunt to witness this magic unfold. It was such a cool experience and I think we spent over an hour just watching their aerobatics. Salmon lead incredibly bizarre life cycles. To help support the local wildlife conservation efforts, and let’s be real here, see moose and bear inches away without fearing for our lives, we stopped here. I think it was a competition to see who could spend more $ in the gift shop that day. I won. Such gorgeous creatures. Love those fuzzy horns! Our “splurge” for the trip was a one night stay at Alyeska Resort en route back to Anchorage for our flight back to the mainland. Now…I say “splurge” but we had an incredibly “unique” experience at this hotel and I feel like we need to go back to make it right. Our only expensive dinner of the entire trip was bombarded with a spoiled brat kid who kept screaming in the dining hall overseen by her equally selfish parents who just sat there eating their dinner like nothing was happening around them. I was absolutely shocked they did not address the issue and even more shocked the administration of the restaurant did not respond either. Believe it or not, I did not say anything which in hindsight, I would have done differently as it was clear that this family was ruining the meals of everyone in the restaurant. To add to the insanity of our dinner, they have an incredible pool and jacuzzi that looks out over the mountain. So…the one hour we decide to visit the pool and relax in the spa, someone left an explosive diarrhea trail leading from the pool, down the hall, and throughout the bathroom. I mean really…tis’ our luck with 24 hours at a high end hotel. This is why we stick to tents and cabins in the woods. Alyeska…you owe us a do over. Though you are still pretty awesome on the outside. Hiked up and around Glacier Bowl which was pretty rad. So we weren’t meant to leave. 7 hour delay. Thanks Alaskan Airlines for the free snacks, food credit, and $150 voucher per person for our next flight. I call this one, “random cheap hotel pool shot because our flight was delayed by a whole day and we needed a night to recoup”. Plans were up in the air at this point so we picked Diamond Lake off the map and got a sweet lakeside campsite for a few nights. Now, if you want to step back into the 80s (my childhood era for example), you want to hit up the Diamond Lake marina and beach. Just go. You’ll thank me later. Back in the tent with campfire, cooler full of groceries, and hammocks hung. Life is good. Morning coffee with a view of Mount Bailey in the distance. How can you not love camping?? Check out this 80s style marina! So groovy! That’s our campsite over there…can you see it? Met some cool buddies and took them out on our boat because the only thing better than having a boat is having friends with a boat. There he goes again with the wood whittling. He made this for a friend he met here. And no, that shirt never came clean again. Plan B was easy with Crater Lake a 15 minute drive away. Phew. There was also a major sign that we were supposed to be there. Keep scrolling to find out. We took the Cleetwood Trail down to the lake which is a short trail but a bit tough coming back up with an 11% grade the entire way. Was it worth it? To see a guy in an Elf costume at the shoreline of Crater Lake? Heck. Yes. Now here’s the cool part. This Elf guy was traveling the world, wearing this costume and photographing himself doing fun things and sending the videos and photos to his nephew. I never had an uncle that cool. Forgive the quality of the next pic as it’s a screenshot of an iphone video I snapped of him jumping. Elf…jumping off a rock at Crater Lake. Clearly we were meant to be here. Well…we have come to the conclusion of our Pacific Northwest/Alaskan journey. For me sadness. For you, a prize for making it all the way through this post. If you decide to do Alaska, please take me. © 2019 Clark Family Diaries|ProPhoto Photographer Blog by NetRivet, Inc.